Sri Lankan Masters shuttlers came up with a brilliant performance on the final day of the first ever Masters Badminton Tournament winning 9 finals out of 29 finals at the Sugathadasa Stadium yesterday. India won 6 finals and the other wins were shared by China, Indonesia, Malaysia and Macau in different age classes. Australia, New Zealand, Hong Kong China and Taipei too fared well but were not able win any events and had to be content with silver medals in the men’s and women’s singles, doubles and mixed doubles categories. Sri Lanka’s Chandrika de Silva and Niroshan Wijekoon won their matches beating their foreign opponents. Chandrika partnering Kaushali Dissanayake in the women’s 40+ defeated compatriots Priyanka Abeyratne and Arati Patwardhna (IND) in straights. Later in the day Chandrika outplayed Vipuli Abeysekera in the singles to make it a double. In the Men’s 50+ Niroshan routed India’s Maran Thagavelu to take the gold. Bin Abdullah Dave playing against had no difficulty in downing New Zealand’s Angus Husein in the 60+ men’s single to carry away the gold for Malaysia. The two Indonesians who participated in the 60+ and 65+ singles played well to take the gold in both events. Arnold Dendeng overcame India’s Philip Bency and Luddy Budman outplayed Malaysia’s Yowsong Lim to make it a double for their country. Rohan de Silva who is the mentor of this tournament partnered by Indonesia’s Frits Mainaky in the 65+mixed doubles was stretched to the full three sets by India’s duo of Vijayakumar Krishnamoorthy and Sommasherappa before winning 2-1 (15-13, 15-8, 15-8). In the women’s class Vipuli Abeysekera and Ranjini Seneviratne were in superb form and displayed their best in the 45+ class to beat Aley Chetan and Kavithaa Sirinivasan. In the 40+ women’s Sangeetha Rajagopal and Suzanne Venglet added another gold for India when they defeated Jin Yun Fang and Wei Lin of China of Macau. 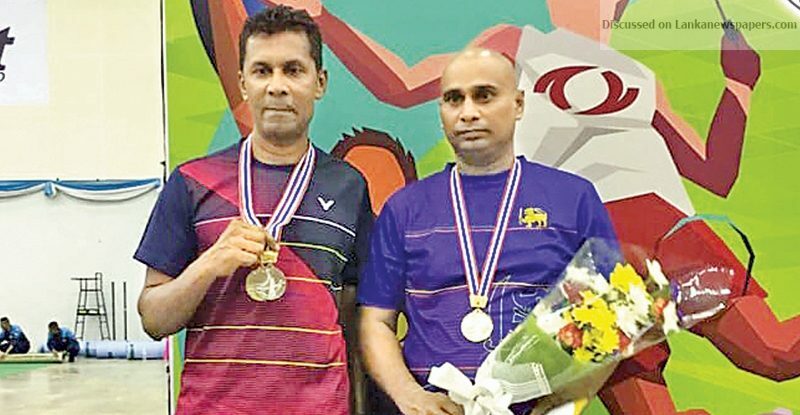 Sri Lanka’s Clarence Homer who combined with Ajith Upendra Jayawardena defeated the local pair Subash Janaka de Silva and Duminda Jayakody to win the gold in the Men’s 45+ doubles. Kooinyen Chong and Tang Xiang Gu of Malaysia/China outclassed New Zealand/Australia combination of Angus Husein and Bin Abdullah Dave comfortably to take the gold. Taipei’s Chen Ya Shan in the women’s 35+ category could not face the onslaught of Sri Lanka’s Umanga Ratnayake and lost. The Commander of the Sri Lanka Army Lt. General Mahesh Senanayake was the chief guest at the awards ceremony. Before the awards ceremony addressing the participants and the spectators he said that the tournament was well organized and it brought honor to the country though it was the first time that a mega event of this sport was held here. “Sports not only helps gain good health but also helps achieve peace among participants and society at large,” he said. He thanked the organizers for inviting him to be the chief guest at this mega International event which attracted nine countries from the Asian region.